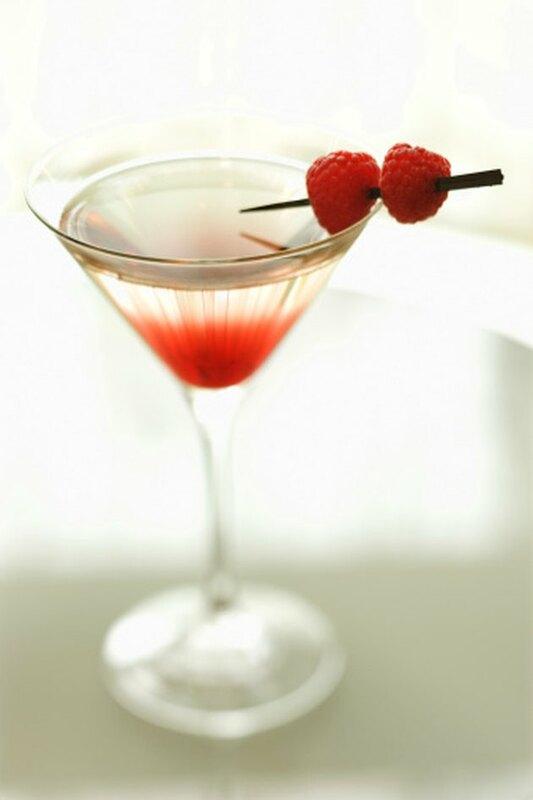 You can make tasty raspberry vodka cocktails, such as a raspberry martini or a cosmopolitan, by taking extra preparation steps and combining the vodka and fruit yourself a few days ahead of time for the foundation, or you can use a commercial raspberry-flavored vodka instead — many producers of vodka offer raspberry varieties. Mix a variety of trendy drinks with raspberry vodka and few simple ingredients. Clean and slice half of a lemon into wedges. Place the wedges in a small bowl or similar container. Cover and set aside. Wash one lime and slice up half of it into wedges. Place the lime wedges in a small bowl or container. Cover and set aside. Squeeze juice from the other half of the lime into a small pitcher or container. Cover the lime juice and set it aside. Make a sweet-and-sour mix with lemon juice and sugar. Pour 8 oz. of lemon juice into a shaker. Add 2 tbsp. of sugar and shake until blended. Pour the mixture into a small pitcher or container and cover. Keep the sweet-and-sour mix separate from the remaining lemon juice. Ice a cocktail glass by filling it with a scoop of ice and a bit of water. Set it to the side and begin mixing the raspberry vodka martini ingredients while you’re waiting for the cocktail glass to cool. Load a scoop of ice into your cocktail shaker. Pour 1 1/2 oz. of raspberry vodka into the shaker over the ice. Add 3/4 oz. of raspberry-flavored Chambord liqueur to the mix for extra fruit essence. Include .20 oz. of sweet-and-sour mix or lemon-lime soda and .20 oz. of fresh cranberry juice. Empty the ice water out of the cocktail glass. Shake the combined martini ingredients in the shaker until thoroughly mixed. Strain into the cooled cocktail glass. Garnish with a lemon wedge. Chill a cocktail glass by filling it with ice water and set it aside while you prepare the ingredients for a raspberry kazi. Combine a scoop of ice, 1 oz. of raspberry vodka, 1 oz. of triple sec and 1 oz. of sweet-and-sour mix into a clean shaker. Add 1/2 oz. of grenadine syrup for extra flavoring, the Drinks Heaven website suggests. Shake until well-blended. Dump the ice water from the cocktail glass and pour the drink mixture into it through a strainer to serve. Garnish with a lime wedge. Cool a cocktail glass by filling it with ice water and setting it aside while mixing raspberry cosmopolitan ingredients. Pour 1 oz. of raspberry vodka and 1/2 oz. of orange liqueur into a clean shaker. Add a scoop of ice, a splash of lime juice and a splash of cranberry juice. Shake ingredients until thoroughly mixed. Remove the ice water from the cocktail glass. Pour the cosmopolitan mixture into the glass through a strainer. Grab a lemon wedge and cut or shave off a piece of the peel. Coil it with your fingers to make a lemon twist garnish. Hang it over the edge of the cocktail glass and serve. You can substitute orange liqueur with triple sec in some drink recipes, but keep in mind that triple sec is very sweet. Lemon-lime soda can replace sweet-and-sour mix in some drink recipes, but it may change the flavor or personality of a drink. Always drink alcohol responsibly; if you're hosting a gathering where cocktails will be flowing freely, offer to call a cab for any guests needing a ride home.